Join the discussion on our forums! 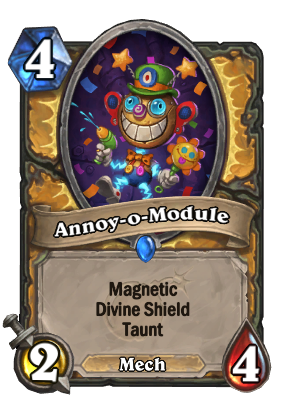 Come discuss Annoy-o-Module over in our dedicated Annoy-o-Module discussion topic. That flavour text just reminds me of how annoying my phone is. We've all seen how underwhelming this stat line is in practice. I thought lone champion looked pretty good when it got released and it's just not as good as it looks on paper due to the 2 att. This card standalone is only worth about 3 mana so it really has to get carried by the magnetic tag. You want to attack this to a mech with reverse stats like a 3/2 mech or 4/3 mech, It's pretty bad on things like frame bot cause then u just make a pile of health with very little att. Overall if you use this as a buff it's probably a bit worse than Kings on average and Kings is like a 3/5, bearly playable sometimes (I personally don't like kings that much). This, however, does set up the legendary spell quite nicely. I'm feeling generous, I'll give it a 3 cause paladin might get more mech support. A 2/4 minion with taunt is already a 3 mana value. Add Divine Shield and 4 mana makes this a Good value card. But being able to give those stats as a buff to an already established Mech card makes this a Very Good value card. a 3 mana 3/4 isn't even good enough, no one plays the warrior monkey. More annoying divine shield+taunt minions, woohoo. Please. Don't. We. Are. Raging. Enough. Already. Think this card will only be played from stonehill defenders, i dont want this in my deck. Turns out, you want this in your deck. This card does have potential. The underlying text is more like "Choose a Mech and give it 2/4 with Divine Shield and Taunt". So the Divine shield can be used immediately on a mech that can attack and it gains health. The attack increase can also allow for some responsiveness. Edit: Another way to look at it. It is like a modified version of Blessing of Kings . Lose the two attack in exchange for Taunt and Divine Shield, but only with mechs. Next standard year: a 3/6 Divine Shield Taunt Mech for 6 mana. 2nd next standard year: a 4/8 Divine Shield Taunt Mech for 8 mana. 3rd next standard year: a 5/10 Divine Shield Taunt Mech for 10 mana. 4th next standard year: Annoy-o-Giant: 8/16 Divine Shield Taunt Mech for 16 mana, Get's cheaper by two mana for each Annoy-o-Tron type minion you played this game. 5th next standard year: ??? Voice Line: "Hell No! Hell No! Hell No!" Considering Voidlord = 3 Voidwalker. Will this card magnetize with Annoy-o-Tron and become the all mighty Annoy-o-lord? I think that i can hear Mechwarper laughing like Ben Brode. Turn 9 Master Oakheart, recruit Bolvar, Fireblood, Annoy-o-Module and Zilliax, three minions with Divine Shield and Taunt, that's value! I think the majority of people rating this card have completely missed that it has magnetic. If there's a viable mech paladin deck, this will be a monster.